I could sure use some help with this image. It's awesome. But I don't know anything about it. "Deerfoot"--aka Louis Bennett--was one of the great runners of the late nineteenth century. 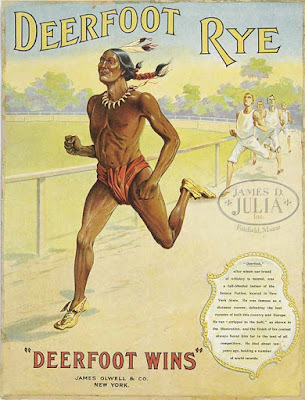 A Seneca Indian, Deerfoot gained notoriety while racing in England from 1861-63. "Pedestrianism," as it was called, was all the rage. Yes, the drama of the races attracted crowds--up to 10,000 at the hyped events. But this was also an opportunity to gamble. And gamble they did, on everything from the winner to the margin of victory to individual splits. Deerfoot became a celebrity in this world not only for his talent, but for his persona. He ran with his chest uncovered, a breechcloth around his midsection, and an eagle feather in his headband. The look was entirely intentional, the creation of his manager/promoter, who also, curiously enough, enlisted an "interpreter" for the English-speaking Indian. In his final race before returning to the U.S., Deerfoot wanted to leave his mark. Leading up to the event, it seemed that he was burned out. He had raced almost non-stop since he arrived, traveling throughout England, Scotland, and Ireland. Deerfoot also reportedly enjoyed the nightlife a little too much. But with one race left, he powered through 10 miles at 51:26. At an hour, his distance was 11 miles, 970 yards. And his 12 mile time was 1:02:02. All of these were records. In fact, his mark for the hour would not be surpassed until 1953, when the Englishman Jim Peters ran a mere 16 yards further. When Deerfoot returned to America, he continued racing until he "retired" at at the age of forty. He died in 1897. "England as well as America admired this Indian runner," proclaimed one obituary. What fascinates me is the way in which Deerfoot's story tells us about the mechanics of fame. In England and America, promoters accentuated his Indianness to draw in crowds. The crowds then paid to see him; the crowds then gambled for and against him; and the crowds then turned this amalgam of money, marketing, endurance, and curiosity into an athletic spectacle. The image above adds to this story. I only have one problem... I can't find anything out about it. Nothing. This particular image comes from an antique auctioneer. That same image is on a beer tray too. But none of these places elaborate on the image, the whiskey, or the producer. I suspect that this ad campaign happened after Deerfoot's death. But again, I just don't know. As this book comes together, I am finding that images are playing a significant role in my story. My intention in using images, though, is not simply to illustrate my text. I want them to be integrated into the narrative, pulling us deeper into the sports cultures that are under examination. So if you know anything about this image, I certainly would be grateful for your insights. This one might just be lost to history, but who knows. I know Devon Mihesuah (https://en.wikipedia.org/wiki/Devon_A._Mihesuah) has done work on Native stereotypes in popular culture. Perhaps she'd know to whom you might go for more information? Good luck! Right! This was about the same time that you began seeing Indian "mascots" at universities too. So it fits into that trend. Great suggestion on Mihesuah. I have read some of her work, and she might have some leads. Thanks!! !